Social And Emotional Skills: Everybody Loves Them, But Still Can't Define Them : NPR Ed Social-emotional learning. Grit. Resilience. Agency. Empathy. Executive function. Education experts agree these are all crucial for student success, but the agreement stops there. More and more, people in education agree on the importance of schools' paying attention to stuff other than academics. But still, no one agrees on what to call that "stuff." I originally published a story on this topic two years ago. As I reported back then, there were a bunch of overlapping terms in play, from "character" to "grit" to "noncognitive skills." This bagginess bugged me, as a member of the education media. It bugged researchers and policymakers too. It still does. If anything, the case for nonacademics has gotten even stronger since then. In fact, it has been enshrined in federal law. The Every Student Succeeds Act mandates that states measure at least one nonacademic indicator of school success. There is also new research indicating that school-based interventions to promote social and emotional skills have large, and long-term, positive impacts: an average of $11 for every dollar invested, according to an analysis by the Robert Wood Johnson Foundation (which is a supporter of NPR). But despite all the hoopla there is still — still! — no consensus on how to define these indicators, or even on what to call them. "Basically, we're trying to explain student success educationally or in the labor market with skills not directly measured by standardized tests," Martin West, at the Harvard Graduate School of Education, originally told me. "The problem is, you go to meetings and everyone spends the first two hours complaining and arguing about semantics." West studies what he calls "noncognitive skills," although he is not completely happy with that term. This isn't just a semantic issue, argues Laura Bornfreund at the New America Foundation. She wrote a paper on what she called "Skills for Success" because she didn't like any of these other terms. "There's a lot of different terms floating around but also a lack of agreement on what really is most important to students." As Noah Webster, the great American lexicographer and educator, put it back in 1788: "The virtues of men are of more consequence to society than their abilities; and for this reason, the heart should be cultivated with more assiduity than the head." Yet he didn't come up with a good catchall, either. So, in Webster's tradition, here is a short glossary of terms that are being used to talk about that cultivation of the heart. According to the Partnership for 21st Century Learning,, a research and advocacy group, these include the "4Cs of critical thinking, collaboration, communication and creativity," as well as "life and career skills" and "information, media and technology skills." The problem, says West, is that "if anything, all the evidence would suggest that in the closing decades of the 20th and 21st centuries, cognitive skills became more important than ever." So this term, although it's often heard in business and technology circles, doesn't necessarily signal the shift in focus that some researchers want. Character education has a long history in the U.S., with a major vogue in the 1930s and a revival in the 1980s and 1990s. The KIPP (Knowledge is Power Program) network of charter schools, for example has a curriculum of seven "character strengths": grit, zest, optimism, self-control, gratitude, social intelligence and curiosity. "We're not religious, we're not talking about ethics, we're not going to give any kind of doctrine about what is right from wrong," says Leyla Bravo-Willey of KIPP Infinity in Harlem. "But there are some fundamental things that make people really great citizens, which usually include being kind." West argues that the use of "character" is inappropriate in research and policymaking because of its moral and religious connotations. He notes that many of the qualities on the KIPP list — grit and self-control, for example — are designed to prepare students for success. "That's in tension with a traditional understanding of character, which often implies something being good in and of itself — which often includes some notion of self sacrifice," says West. That distinction doesn't bother Bravo-Willey. She says that the school is responding to parents' own wishes that their children be happy and good as well as successful. See also: These days you might hear educators talk about the importance of empathy or perspective-taking. Grit is a pioneer virtue with a long American history — think of the classic Western True Grit. When Angela Duckworth was working on her dissertation in the mid-2000s, she chose the term to encapsulate the measures of self-control, persistence and conscientiousness that she was finding to be powerful determinants of success. It quickly caught on — maybe too quickly, the University of Pennsylvania psychologist told me. "I'm grateful for the attention, but that gratitude and amazement was quickly replaced by anxiety about people thinking that we had figured things out already." She is worried that grit is being overemphasized: In a 2015 paper, she argued that grit measures aren't ready to be incorporated into high-stakes accountability systems. "I'm also concerned that people interpret my position to be that grit's the only thing that matters." Grit has attracted a lot of attention, and naturally, that comes with criticism. In the past two years, some researchers have argued that grit effects have been overblown. Others have argued for more attention to the social context of the trait. A child growing up in the lap of luxury simply faces fewer obstacles. "Grit" may be seen as a way of blaming kids who are struggling for the impact of poor neighborhoods or underresourced schools. See also: Agency. Anindya Kundu, a doctoral student at New York University who counts Duckworth as a mentor and Pedro Noguera, an eminent scholar of the achievement gap, as an adviser, is investigating a concept called agency. It's like grit, but different. "Agency is one of sociology's oldest concepts," he says. Basically, it's "the amount of power that a person has to influence their own life." Agency brings in social context, structural inequality and cultural difference. People who manage to succeed despite growing up in poverty, Kundu has found, guard their own mental health and happiness, taking an optimistic view. They learn how to cultivate networks, both trusted intimates and new mentors. And they form goals and are dissatisfied until they reach them. Kundu sees his work as being "in dialogue with" grit research, taking in people's social circumstances as well as their inner abilities. Carol Dweck, the Stanford University psychologist, chose the term "mindset" in 2007 for the title of her bestselling book. "Growth mindset" is the belief that positive traits, including intelligence, can be developed with practice. "Fixed mindset" refers to the idea that intelligence and other talents are set at birth. "In my research papers, I had some very, very clunky scientific-sounding term for the fixed and the growth mindset," she says. "When I went to write the book I thought, these will not do at all." Mindset has caught on tremendously in both the business and education worlds. But Dweck's concern is that it's being used willy-nilly to justify any old intuition that people might have about positive thinking in the classroom. "When people start thinking, 'I'll make the kids feel good and they'll learn,' that's how something like the self-esteem movement gains traction." That 1980s trend led to lots of trophies but little improvement in achievement. Resilience. Pamela Cantor, of Turnaround for Children, began her medical practice in mental health care in poor communities in the Bronx. "What has been called social and emotional learning is now being expanded to be thought of as: How do children become learners?" she says. Children who struggle with impulse control or attention, she says, very often have faced adversity and trauma. At the same time, she says, children's brains are especially malleable. In a safe environment and with trusting relationships, they can improve their readiness to learn. This is resilience. Cantor's organization addresses a lot of the qualities under the social-emotional umbrella, like mindfulness, growth mindset, self-regulation, attachment, executive function and social awareness. But in many ways, resilience is at the heart of what they do. "Once children have a success behaviorally and they come to recognize that they actually do have control over their behavior and can make better choices, and you acknowledge it, then they make better choices." And then they can learn. This term is most strongly associated with the work of Nobel Prize-winning economist James Heckman. He really got this whole field rolling, by analyzing large data sets to show that attributes such as self-discipline and persistence — not just academic achievement — affected education, labor market and life outcomes. This term is "ugly, broad, nonspecific," argues Carol Dweck — and she is a fan. "I'm the only person who likes the term," she says. "And I'll tell you why: It is a very diverse group of factors and the reason it's been hard to come up with a name is that they don't necessarily belong together." Martin West at Harvard uses this term himself, but he says he is always careful to acknowledge that it can be "misleading." "Every skill or trait is cognitive in the sense that it involves and reflects the processing of information of some kind in our brains," he says. And West adds that traditional academic skills more often than not are complements, not substitutes, for the attitudes and personality traits captured by the term "non-cognitive skills." Social & Emotional Learning. Nobody I spoke with hates this term. And in the past two years, it seems to have gained currency. "Increasingly teachers who are on the front line say that it's very important to teach kids to be more socially and emotionally competent," says Roger P. Weissberg, chief knowledge officer of the Collaborative for Social and Emotional Learning, which promotes the concept and the term nationwide. "Teachers feel, and growing research supports, that it helps them academically, it improves school climate, it improves discipline, and it's going to help them to be college and career — and life — ready." Harvard has a lab called Ecological Approaches to Social Emotional Learning, or EASEL. Stephanie Jones, who directs the lab, says, "when you get into definition and terminology there are many overlaps" between fields. EASEL is a big taxonomy project to sort out these overlaps and the evidence-based approaches that go with them, for about a dozen skills. The only problem is that the "learning" part may not be seen as encompassing things that are more like attitudes or beliefs, like growth mindset. 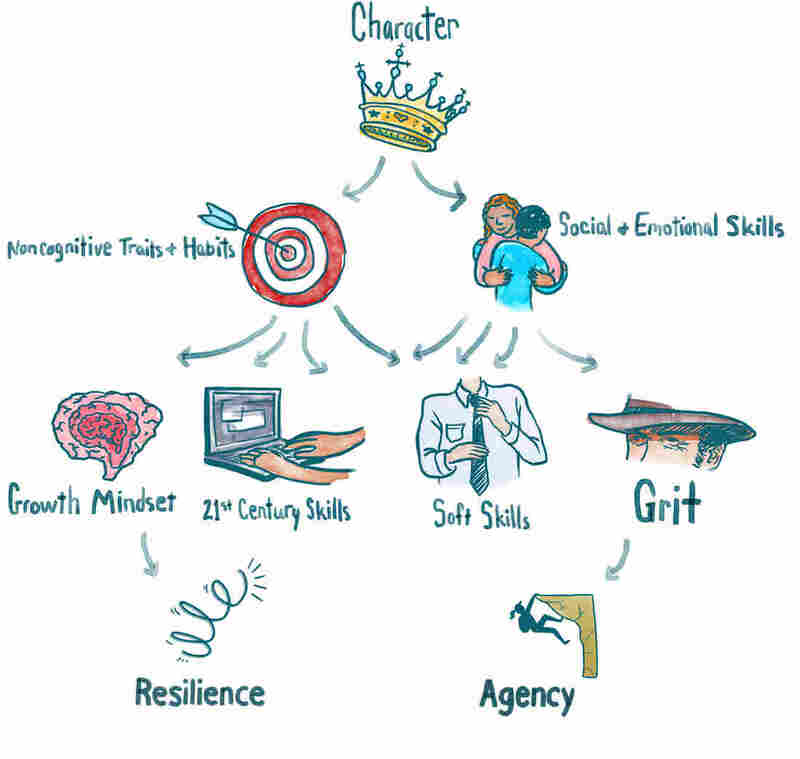 And the "social and emotional" part, again, may be seen as excluding skills that are really cognitive in nature. Reached this month, two years later, Martin West says we may be ready to declare a winner by default. "The semantic debates have died down a bit, but more from exhaustion than from progress toward consensus. Most people seem to be using social and emotional (or social-emotional/socioemotional) learning as a catchall." But Bornfreund is sticking to her guns. "I still refer to them as Skills for Success for short; skills, habits and mindsets for success would be the full descriptor. Because they are both cognitive and academic, and more than character traits, those labels don't fit. I haven't heard any new terms that fit better." Have you? Reach out to us on Twitter at @npr_ed.